Superdrug have really picked up their game recently, with massive financial investment enabling the changes. 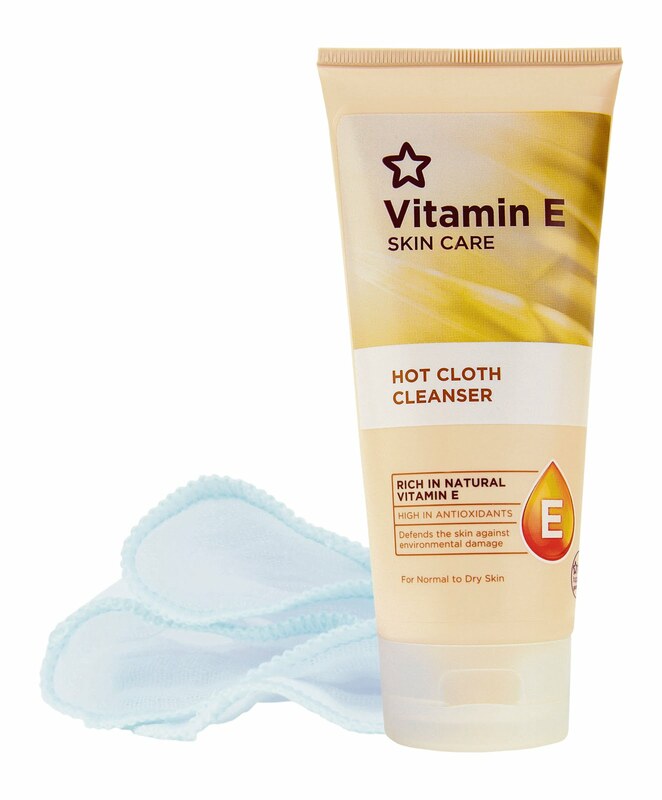 I've received a number of releases from the PR in the last couple of months, not least details of their Beauty Card launch but the one which really grabbed my attention was the introduction of Vitamin E Hot Cloth Cleanser, launching Monday. I expect that this is going to be a huge success so I was delighted to be sent a sample to trial in advance. Whilst I believe that you should spend as much as you can afford on your skincare, it's inevitable that luxury brands are only accessible to a few so I'm equally interested in hearing (& sharing) details of products which offer good value for money. I'm a big fan of hot cloth cleansers although they can be pricey (Liz Earle's version is without doubt the most popular affordable version). Superdrug's Vitamin E Hot Cloth Cleanser seems to provide the perfect value option, offering a generous 200ml PLUS muslin cloth for just £4.99 (I'm hoping the boy won't confuse this one for a cleaning cloth as he did my precious Eve Lom ones which he "helpfully" put away with the Mr. Muscle & Cif under the sink!)! I quite like that it's not a pretentious offering. Superdrug isn't a destination shop but provides value items in a convenient manner and this is testament to that. Unlike the tubs of balm and pump dispensers I've used in the past, Superdrug Vitamin E Hot Cloth Cleanser is a large tube presented in a box with aforementioned muslin cloth. The texture is similar to a thick body lotion and still does the job although doesn't feel as pampering as my favourite balms such as The Organic Pharmacy's Carrot Butter Cleanser. My skin has been quite sensitive of late and I was a little concerned to feel a slight tingling sensation upon application- I think I'd be fine if my skin was behaving itself but ingredients such as alcohol & parfum are listed quite highly so those with very sensitive skin might want to watch out. After use, my skin was left feeling deeply cleaned, soft and with a refined texture & appearance. Overall, I'm impressed with this for the price. It's not going to replace my indulgent cleansers & I'm pleased that my first experience was with the luxury variety but if you're looking to cut costs, it'd be hard to beat this.